Mandatory arbitration clauses are undermining consumer protections, civil rights, and employment laws that level the playing field between big businesses and individuals. It's time to end mandatory binding arbitration. 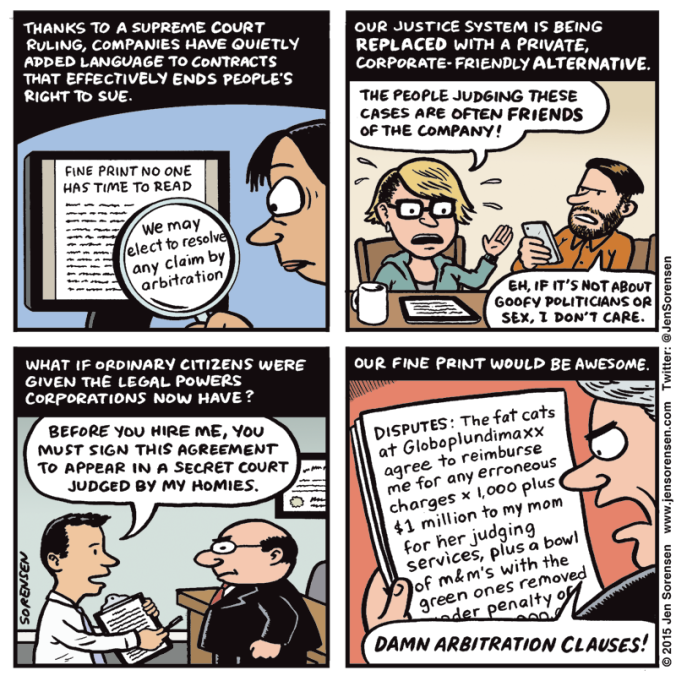 Companies force consumers to give up their right to use the legal system to resolve disputes by embedding language in contracts that say in the event of any dispute, both parties have to go to an arbitration firm. 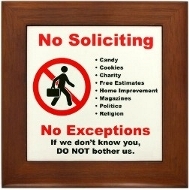 any dispute or claim relating in any way to your use of any Amazon Service, or to any products or services sold or distributed by Amazon or through Amazon.com will be resolved by binding arbitration, rather than in court. Arbitration clauses are usually outlined in tiny print, buried in lengthy documents and written in legalese that is incomprehensible to most people. Moreover, these clauses are mandatory, meaning that people are compelled to agree to arbitration even before a dispute arises. Because entire industries are inserting these arbitration terms into contracts, there is usually little choice but to agree to them. In other words, “consent” is not voluntary, at all. Over the last few years, it has become increasingly difficult to apply for a credit card, use a cellphone, get cable or Internet service, or shop online without agreeing to private arbitration. The same applies to getting a job, seeing a medical specialist, buying or renting a car, or placing a relative in a nursing home. Arbitrators are not required to have any legal training and they need not follow the law. Court rules of evidence and procedure, which tend to neutralize imbalances between the parties in court, do not apply. There is limited discovery making it much more difficult for individuals to have access to important documents that may help their claim. Arbitration proceedings are secretive. There is no right to public access. Arbitrators do not write or publish detailed written opinions, so no legal precedent or rules for future conduct can be established. Their decisions are still enforceable with the full weight of the law even though they may be legally incorrect. Arbitration providers are organized to serve businesses, not consumers. Their marketing is targeted entirely at businesses, and their panels of arbitrators consist primarily of corporate executives and their lawyers. Since only businesses will be repeat users of an arbitrator, there is a disincentive for an arbitrator to rule in favor of a consumer or employee if he expects further business. The top 10 most used arbitration firms only found in favor of the consumer less than 2% of the time, so it's no wonder they are popular with corporations who contract with consumers, but not so much with corporations who contract with other corporations. In 2002, car dealers actually lobbied Congress to get binding arbitration clauses banned in their contracts with auto manufacturers. The dealers were asking Congress for an exemption at the same time they were adding binding arbitration clauses to sales contracts with their customers and claiming it was for everyone's benefit. Comparisons of average awards by arbitrators and courts in employment cases and medical malpractice cases show that even in the rare cases where arbitrators decide to award damages, arbitration claimants receive only about 20 percent of the damages that they would have received by going to court. In 2015, employees of Guitar Center were ordered to sign a mandatory arbitration agreement or lose their jobs. The agreement forced employees to give up their rights to sue the company in class action lawsuits if they believe there has been discrimination, or in the case of wage violations and unjustified terminations, and other types of disputes. 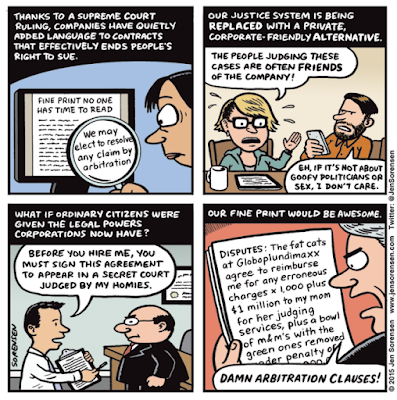 Today, nearly every arbitration clause prohibits participation in class action lawsuits. By banning class actions, companies have essentially disabled consumer challenges to practices like predatory lending, wage theft and discrimination. The Supreme Court has repeatedly upheld the use of binding arbitration clauses — even in situations where mounting a case is so expensive that a class action would be the only financially feasible way hold a company accountable. A study of 4,000 arbitration cases found that employees complaining of on-the-job discrimination won only about 21 percent of the time. In court, they win discrimination suits 50 to 60 percent of the time, other studies show, and receive damage awards that are five times higher, on average. The folks at Public Citizen keep a Forced Arbitration Rogues Gallery on their website. These corporations put “forced arbitration” clauses in their terms of service to block consumers from holding them accountable in court. If consumers (or employees) are hurt or ripped off by these companies, they must take their claims to private, secretive tribunals that favor the companies. A 2007 report by Public Citizen found that over a four-year period, arbitrators ruled in favor of banks and credit card companies 94% of the time in disputes with California consumers. Consumer contracts with Amazon, Netflix, Travelocity, eBay and DirecTV now contain arbitration clauses. Sprint, a company with more than 57 million subscribers, faced only six arbitrations between 2010 and 2014. While some companies also include an opt-out provision on arbitration — typically between 30 and 45 days — few consumers take advantage of it because they do not realize they have signed a clause to begin with, or do not understand its consequences. A 2000 Washington Post survey of cases involving First USA Bank, then the nation's second largest credit card company, revealed that arbitrators ruled for the bank 99.6 percent of the time. In 2007, a Public Citizen report revealed that one giant firm, the National Arbitration Forum, hired out its private adjudicators to hear some 34,000 consumer-versus-bank cases in California during the previous four years, and they ruled for the financial giants 95 percent of the time. Even more incredible, the City of San Francisco discovered in a 2008 lawsuit that of 18,045 cases brought by the financial powers against overwhelmed California consumers, NAF's private judges sided with the corporations 100 percent of the time. A Consumer Financial Protection Bureau report found that 75% of consumers surveyed did not know if they were subject to an arbitration clause in their credit card contract. And among consumers whose contract included an arbitration clause, fewer than 7% recognized that they could not sue their credit card issuer in court. Roughly two-thirds of consumers contesting credit card fraud, fees or costly loans received no monetary awards in arbitration. 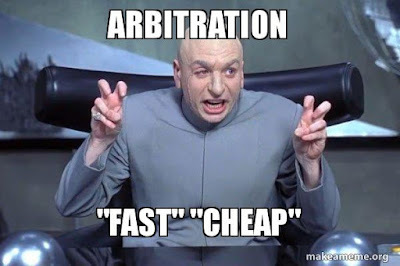 A 2000 study of forced arbitration in HMO contracts found that on the rare occasion that an arbitrator made a significant award for a patient, the HMO never hired that person to arbitrate a case again. The most prominent effort to deal with mandatory arbitration at the federal level has been the Arbitration Fairness Act (AFA) that has been proposed in every new Congress since 2009 and gone nowhere. 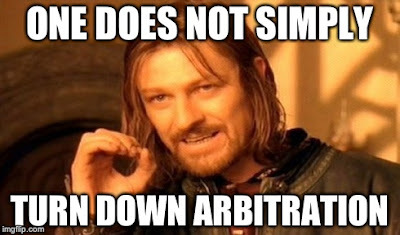 If enacted, the AFA would effectively eliminate all mandatory arbitration in the employment or consumer realms, as well as in antitrust and civil rights cases. In its statement of congressional findings, the proposed AFA specifically refers to the problems of employees and consumers having little effective choice about entering mandatory arbitration agreements, the deleterious effect on the development of public law, and the lack of judicial review. Most recently, the AFA was again proposed in 2017 in the Senate by Sen. Al Franken, D-Minn. (S.537) and in the House by Rep. Henry Johnson D-GA (H.R.1374). However, neither bill has been up for a vote and given the current Congress, the bills are unlikely to ever make it out of committee. 1. Read contracts thoroughly to see if they contain a mandatory arbitration clause. 2. Opt out of mandatory arbitration if you can. There may be a time limit to opt out, so don't delay. 3. 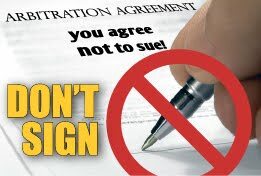 If you cannot opt out and cannot find an alternate company to do business with, write on the contract: "I object to this mandatory arbitration clause, but am signing this contract because I am told I have no choice." Initial the statement. 4. If you receive a notice from a credit card company or insurance company notifying you of changes to your contract, read it carefully. 5. Don’t be afraid to speak up! If you find an arbitration clause objectionable for any reason, make your feelings known to company management. There may be a possibility to negotiate if the company wants your business, or you as an employee badly enough. 6. Contact your representatives in Congress and demand action on the Arbitration Fairness Act of 2017.